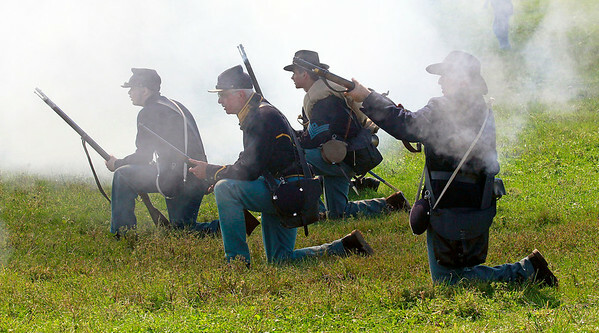 Candace H. Johnson-For Shaw Media Union soldiers with the Illinois Battalion fire upon the Confederates in a skirmish during the Civil War Re-Enactment and Battle at the Northbrook Sports Club in Hainesville. 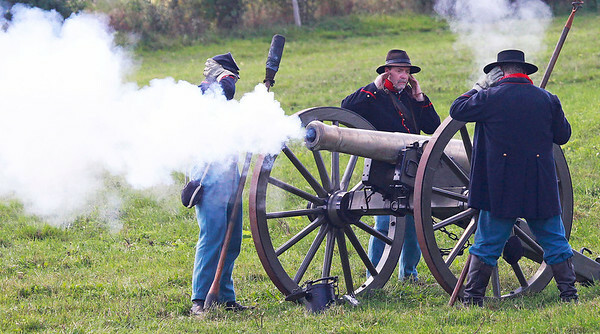 Candace H. Johnson-For Shaw Media The Chicago Light Artillery Company A shoots off a 6-pound field cannon during the Civil War Re-Enactment and Battle at the Northbrook Sports Club in Hainesville. 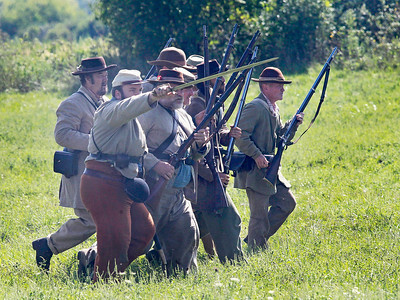 Candace H. Johnson-For Shaw Media Confederate soldiers advance while fighting Union soldiers during the Civil War Re-Enactment and Battle at the Northbrook Sports Club in Hainesville. 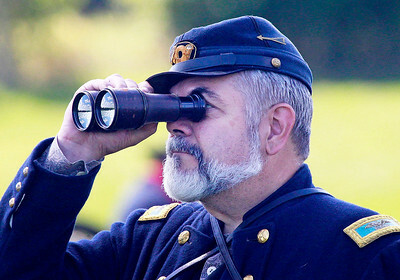 Candace H. Johnson-For Shaw Media Gerry Morin, of Antioch, a Union general with the Illinois Battalion, looks through his binoculars while his men fight in a skirmish during the Civil War Re-Enactment and Battle at the Northbrook Sports Club in Hainesville. 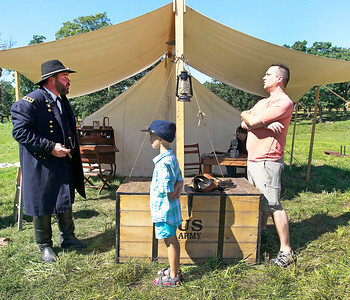 Candace H. Johnson-For Shaw Media General Ulysses S. Grant, portrayed by Wayne Issleb, of Trevor, Wis., talks to Mark Lenczycki, 7, of Grayslake and his father, Alan, during the Civil War Re-Enactment and Battle at the Northbrook Sports Club in Hainesville. 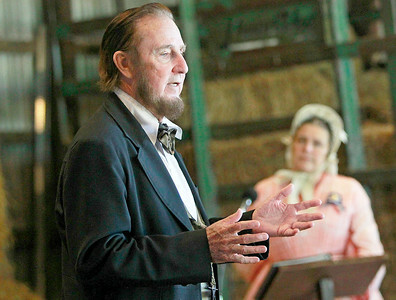 Candace H. Johnson-For Shaw Media President Abraham Lincoln portrayed by Max Daniels, of Wheaton, states his views at a press conference and debate with Jefferson Davis during the Civil War Re-Enactment and Battle at the Northbrook Sports Club in Hainesville. 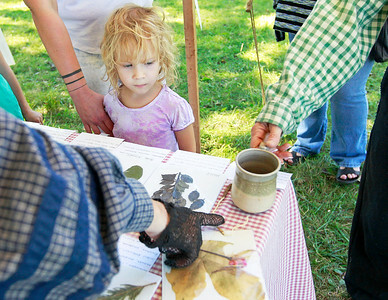 Candace H. Johnson-For Shaw Media Daisy Snow, 4, of Lindenhurst learns about different plants used during the Civil War including chicory root which was used to make coffee during the Civil War Re-Enactment and Battle at the Northbrook Sports Club in Hainesville. 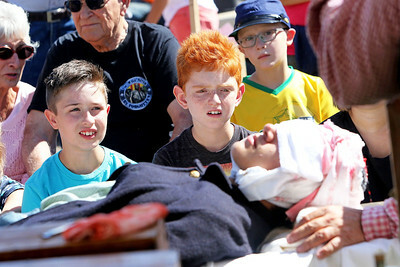 Candace H. Johnson-For Shaw Media Henry Dodds and Jackson Allen both 10, of Hainesville watch a Union solder get surgery for a head wound during the Civil War Re-Enactment and Battle at the Northbrook Sports Club in Hainesville. 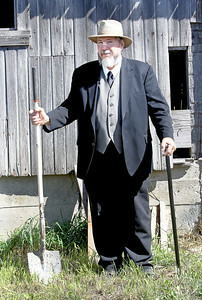 The soldier was portrayed by Hilario Deleon, 15, of Milwaukee, Wis.
Candace H. Johnson-For Shaw Media Elijah Haines, Hainesville Founder, portrayed by Bob Dawson, of Round Lake Beach, stands for a portrait during the Civil War Re-Enactment and Battle at the Northbrook Sports Club in Hainesville. 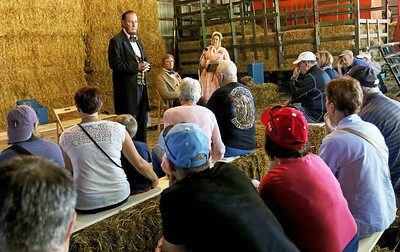 President Abraham Lincoln portrayed by Max Daniels, of Wheaton, states his views at a press conference and debate with Jefferson Davis during the Civil War Re-Enactment and Battle at the Northbrook Sports Club in Hainesville.